Meet the Sennheiser Ambeo Smart Headset! What is the Ambeo Headset? Ambeo a Peak Into the Future? It has been over a year now since Apple first announced they were dropping the headphone jack from popular iPhone models. While it seemed the entire world felt the sky was falling, Lightning Cans chose to look on the sunny side and actually got pretty excited about the potential new technology that could arise from Apple’s decision to go all-digital. If you don’t want to read the original post, the TL;DR is an all digital connector not only is capable of transmitting higher quality audio than the standard 3.5mm headphone jack, but also opens a whole new world of possibilities because the cable can transmit both data and power simultaneously (as opposed to 3.5mm cables, which can only transmit music). Well, nearly a year on, a company has finally gone ahead and taken FULL advantage of the new all-digital lightning connector to produce the worlds first consumer available “smart headset”. Once you understand that the digital lightning connector is much more versatile than old headphone cables you can begin to imagine all the new possibilities that become available. For example active noise cancellation has always required the use of an external battery pack or external rechargeable lithium ion battery pack. This was cumbersome and not very practical. Now however, as headphones can draw power directly from the devices they are plugged into via the lightning cable active noise cancellation can be built into the headphones themselves without the need for an external battery! Additionally all sorts of data can be transmitted back and forth between smartphones, apps and the headset itself. Sennheiser is one company that seems to understand the potential here and is at the forefront with their Ambeo Headset. Simply put, the Ambeo headset are “smart earphones”. They wrap around your ears and stick into your ear canal like regular earphones but they contain loads more technology. The Ambeo headset not only contains speakers to play music into your ears but also contains microphones to listen to the world around you. Why you may ask? First, all active noise cancellation requires microphones to detect external noise to counter-balance, i.e cancel out. The Ambeo has microphones built into each earpiece that listen to the world around them. Hear The World: Stay connected to the world and hear what's going on around you by activating the transparent hearing feature. Silence The World: Isolate yourself from the world and enjoy your music to the fullest. The Active Noise Cancellation mode allows you to block out background noise whenever you like. Sennheiser calls this technology “Situational Awareness”, meaning you can manually adjust how much of the outside environment you want bleeding into your music or the video you are shooting. Other things that come with the Ambeo Smart headset are high quality digital audio, from Apple MFi certified lightning connection. Utilizing this digital connection Sennheiser also released a dedicated App to fine tune your Ambeo to your personal preferences. Neat huh? Sennheiser is the leader in high end acoustics and the technology packed into the Ambeo headset make it a perfect companion for mobile videographers. Simply plug your headset into your smartphone and start recording your video. The Ambeo headset will record fully immersive “3D” stereo sound. You can also adjust how much background noise you want included in your video. For example if you are recording a loud live event you can essentially “tune down” the crowd with a few clicks of a rocker button. In a quiet remote wilderness and looking to capture the subtle song of crickets? Turn the built-in microphones all the way up to record your surrounding in full digital detail. Previously this type of audio recording required big boxes full of equipment that required a dedicated person to manage. Now a single person with an iPhone can go out and record both beautiful visuals with their phone but also record stunningly detailed audio to accompany it. Hearing the world in 3D is a completely different experience than traditional speakers. One of the first big creators of 3D sound was the partnership of NuForce and Ultrasone with their S-Logic sound system, which revolutionized what was previously thought possible when it came to fully 3D, immersive listening experiences. Well, you can now capture that sensation in a portable headphone system from Sennheiser in their Ambeo headset. The fact that these earphones can be rolled up and fit into a pocket make them a dream accessory for people recording video on the go, people working in difficult terrain, or people looking to work inconspicuously without big bulky microphone booms. Sennheiser has really pushed the envelope here with the Ambeo. We at Lightning Cans are impressed at the uniqueness of this product. We can see this being a big hit with Youtubers, Instagramers, and other digital influencers who are constantly recording on the go. 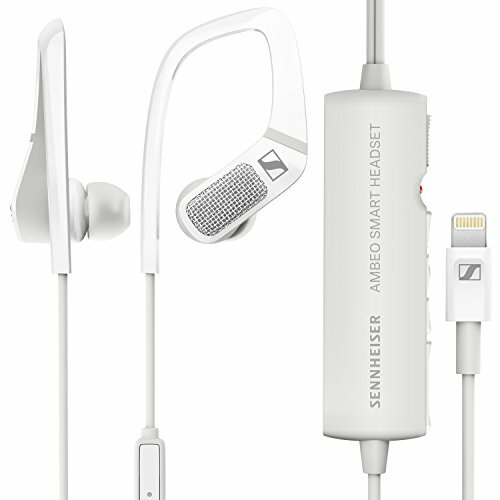 It is nice to see Sennheiser perfect it’s lightning cable technology and active noise cancelling. Many other makers from Philips to Audeze and AKG have released lightning-cable headphones to appeal directly to Apple users. Currently Sennheiser doesn’t have a dedicated musical earbud or over-ear type set of lightning headphones for sale, outside the Ambeo that is. There are companies offering lightning-terminated cables for popular Sennheiser over-ear models, but we would LOVE to see Sennheiser fully capitalize on the digital tech sparked by the Ambeo by releasing some more lightning-enabled, audiophile-quality headphones and earbuds. You can pick up the Ambeo Smart headset from major electronics retailers, Sennheiser’s own website or of course, Amazon.com.